www.photomacrography.net :: View topic - Advice on getting the animal subject to sit still! Advice on getting the animal subject to sit still! Posted: Tue Apr 03, 2018 3:37 am Post subject: Advice on getting the animal subject to sit still! I'm relatively new to macro photography, and most of my subjects to date have been inanimate objects or bugs and flies that I've chased around the garden. 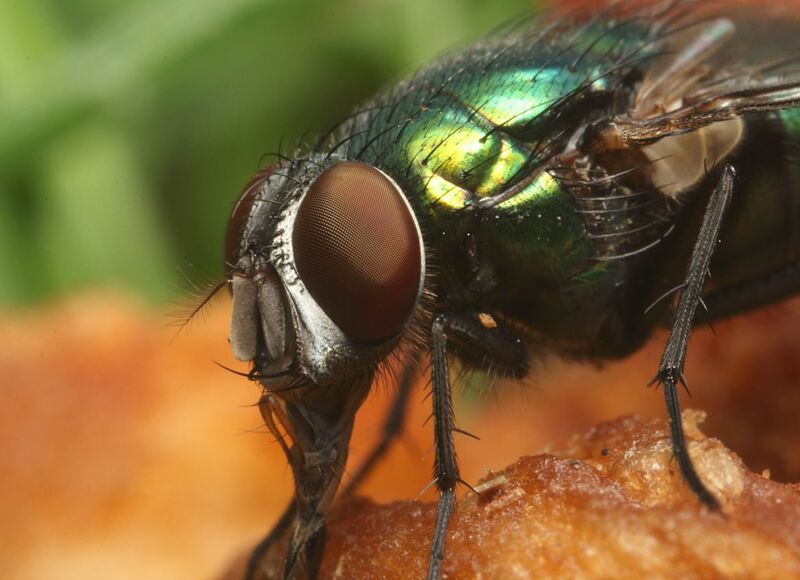 So how do these wonderful images of flies come about? What keeps the subject in one place long enough to allow single (or stacked) images to be taken? My advice is to get up in the morning before the sun is up. Normaly in the season I get out in the field early. The insects are normaly cold and sometimes covered in dew drops. They move very little, so you have time to set up your great. During the morning as the sun come up, they heat up and get more active. I can comment on getting single shots. For the very active sorts of insects (flies, bees, etc.) another method for getting single shots is to go where they are feeding, or give them food and they will linger. Shoot fast, and use settings that help remove camera movement and movement of the subject. Take a lot of pictures, and throw out > 90% of them. I had read somewhere of somebody keeping a little dropper bottle of dilute honey. To help get more shots of bees or flower visiting flies on flowers, they would add a little honey to the flowers so the visiting insects would stay in one spot longer. For single shots of active insects, the method of using tripods, etc. is often just too cumbersome. I then prefer to go with handheld, using any help available for steadying the camera. Macrophotography at magnifications near or less than 1:1 is pretty easy. In that circumstance, when standing to take pictures of subjects off the ground I like to use a steadying pole or monopod to help remove camera movement and to help hold the load (it would be pretty tiring otherwise). Going significantly above 1:1 is much harder, however. I would then use a tripod when shooting off the ground since movements are just too significant otherwise. For this picture (well over 1:1) I was flat on my stomach, and the camera was resting on the back of my left hand. A similar trick is to stack bean bags, which frees up the hand. Camera settings will help remove camera shake and movement of active subjects. Use the fastest shutter speed with flash that your camera will allow, and try to use lower flash power. Again, take lots of pictures, but also frequently examine your pictures. ... the method is simple and effective. I'm not sure if you're interested in this method... if you do just let mw know here and I will show you how to do it. Nice to see the CO2 method working! You would have to do some pretty fast stacking before the subject came around again, I suppose. Thanks to you all for your responses, I can see I have a bit to learn! You can try chilling. I have tried it off and on, but personally never liked the results. The subject never looked natural, and even when they are able to stand they still did not look natural. But that is just my limited experience. There is nothing like just going out and trying. Trial and error is the best teacher. The CO2 thing might be this one: http://www.photomacrography.net/forum/viewtopic.php?t=34817 , but it might have been 'invented' more than once.